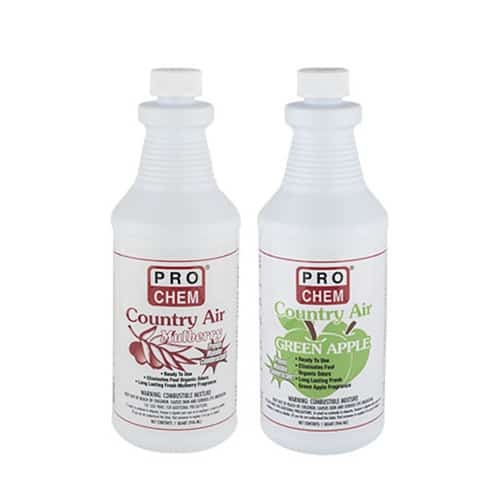 Country Air | Pro Chem, Inc.
COUNTRY AIR is formulated with a unique malodor counteractant which eliminates foul organic odor from carpets, floors, dirty laundry, curtains, kennels, garbage compactors, etc. It effectively neutralizes odors caused by urine, fire or smoke damage, mold and mildew, cooking, stale smoke/beverages, vomit, pets, and much more. Spray COUNTRY AIR directly on or around odor. To refresh air, spray towards center of room whenever odors occur. For hospitals or nursing homes, spray directly on bed pans, urinals, dirty bed linens and used bandage collection areas. For motels and hotels, spray around each bed, carpet corners, toilets and in corners of main lobby.